Built-in exhalation valve. Face piece design prevents filter from collapsing. 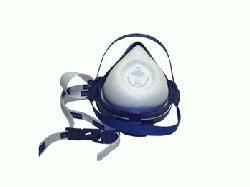 The filter does not touch the face, keeping it cooler and drier than ordinary dust masks. Provides protection from particulates and is ideal for dusty environments such as grinding, sanding and sweeping. Filters are replaceable saving money and reducing waste. Sizes: Small, Medium, and Large.